YOU KNOW WHAT OL’ JACK BURTON SAYS AT A TIME LIKE THIS? 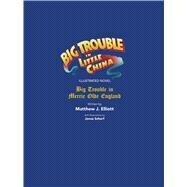 Jack Burton from John Carpenter’s cult-hit film, Big Trouble in Little China returns with Big Trouble in Little England! Forced on an adventure for the lost Excalibur, Jack Burton, Wang Chi, and Gracie Law must traverse the mystical, topsy turvy underbelly of England. Hunted by the Wing Kong and the reanimated corpse of Lightning, they will discover that things are never as they seem. From writer Matthew J. Elliot (RiffTrax; Big Trouble in Mother Russia) comes Big Trouble in Little England, adding a new chapter to the travails of cult hero Jack Burton!